Wow! Week 2 is finished! Another crazy but successful week complete! We had staff meetings, our first fire drill (new school), high-heat days (Yes, that's a thing in AZ. For non-Arizona residents imagine rainy day schedule due to ridiculously high temperatures - noooooooo!!!!!) 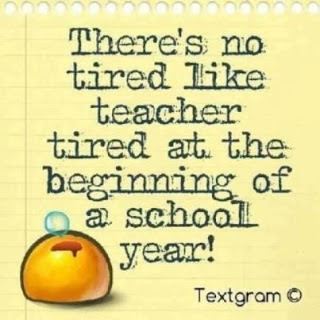 Curriculum Night and the rest is just a blur. We began the week with our first reading story. We use the Journeys reading program and our story was "What is a Pal?" This is a perfect story to start with as we learn about friendship, citizenship and school rules. We began learning how to edit using our Daily Edits. I start so early in the year because I want to set a good foundation as we learn our editing marks. These are also amazing at helping students to really look closely for revisions. I tell them they are looking for my mistakes. I want my little writers to know that it's okay to make mistakes and when we find them in each other's writing we are being helpful by pointing them out and finding them in each other's writing. 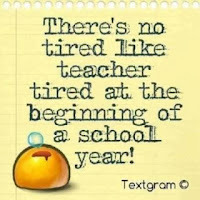 I loved writing this week! On Day 2, we took everyone's ideas and made a Circle Map - it's kinda circle-ish, ha! On Day 3 we took the ideas from our Circle Map and created a Tree Map. We chose to create a simple tree map with Pals Can and Are. We color-code our Circle Map to help as we transition those ideas to our Tree Map. On Day 4 we used our Tree Map to write 2 sentences about Pals. I could not be more proud of Week 2 Writing! HUGE accomplishment! We also began our Interactive Notebooks this week. We learned about Nouns and created this Anchor Chart. (Don't judge...I make my Anchor Chart at Staples because I can't draw, I leave that up to the amazing Krista Wallden at Creative Clips. We then transferred our learning into our Interactive Notebook. The editable notebook cover is a free download here if you want it. Perhaps my favorite part of this week was when we made our Pals Class Book. Yay! Our FIRST Class Book this year! Each kiddo writes their name, their age and three things they love. I put their photo in the space provided and that's it! I made 4 copies so we can take turns bringing the book home to share with our families. Parents LOVE to see the other kids in class and this is fun book provides that opportunity. There was so much more that I didn't get pictures of or didn't get to this week but Monday will be here before I know it and we will continue on. 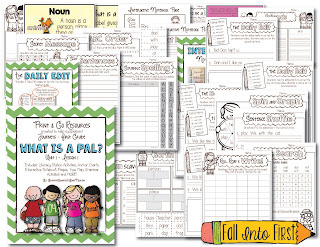 If you are interested in these activities you can grab this entire 37 page packet to supplement the story What is a Pal? in my TpT Store. Don't forget about the upcoming SALE!